After achieving our target of membership for 2003 we set a target for 2004 which we are well on the way to reaching. Last three in the series of country reports presented to the 2004 meeting of the International Executive Committee (IEC) of the cwi, held in Belgium, 14 - 20 November. These are from the CWI sections in Scotland, Sweden and Israel. New recruits this year have included members of the civil service union, PCS, in Glasgow and a leading activist from the Scottish nursery nurses strike in Dundee. We have also recently recruited at Glasgow University which is an important breakthrough to step up our work amongst young people. The growth of our forces is partly a result of an emerging confidence among sections of the working class to take action. We have been very conscious about orientating towards them. This year has seen the strike of 4,000 Scottish nursery nurses over pay lasting ten weeks. This was the longest all-out action by a group of workers in Scotland since the 1984-85 miners’ strike. In Dundee, our comrades played a leading role in the nursery nurses’ union, Unison, and in establishing a support group which involved nursery nurses, parents of children affected by the strike and trade unionists. Our role during this strike led to us recruiting to the party. The civil service workers voted to carry out a one-day national strike which involves over 250,000 workers in action. We play an important role in the PCS in Britain. Our Scottish section includes two national officials of the union and a new layer of PCS members has been recruited to our organisation which has helped to transform the branch there. There is big potential for our work among PCS members in the next period. The section has an important presence in the public sector unions. As well as a base in the PCS, one quarter of our members, are members of the public sector union Unison. Of those, a majority are shop stewards or senior shop stewards. We also have comrades in the teachers’ and postal workers’ unions. Two-thirds of our members are in trade unions. The SSP continues to form an important field of work for us. The continuing and accelerating adaptation by the SSP leadership to reformist and nationalist ideas has opened up more possibilities for our growth. We are seen as the main political opposition to the SSP leadership on all the main debates that have taken place in the SSP - especially on the national question. Our ex-members, in common with other trends internationally have moved away from arguing for socialism on a consistent basis. The idea of socialism has increasingly been replaced with an emphasis on building a "democratic independent Scottish republic" (see material on the Calton Hill Declaration on socialistworld.net) and supporting the idea of a "Social Europe." Still with modest numbers, the ISM (International Socialists, CWI) has become the main left opposition to the SSP leadership. At the 2004 SSP conference we consistently won around 20% of the conference to our position on, for example, Europe and the national question. The 2004 European elections saw the SSP win 5.2% of the vote across Scotland. This was down from the 6.8% won in 2003 at the Scottish Parliament elections. Ironically, given the leadership’s turn towards nationalism, the SSP was out-polled by the nationalist and populist UKIP in Scotland. The active base of the SSP is still only around 600-700 at most with a wider subs-paying membership of 1,500. Amongst wider sections of workers, the SSP is still generally perceived positively. At a parliamentary level the MSPs were vocal supporters of the nursery nurses’ struggle. The SSP also has around 40 PCS members in its PCS group, although only a minority of them are active in the structures of the SSP. The recent more pronounced nationalist turn is having an effect on a layer of workers and especially young people who do not support the idea of independence. It is becoming easier to explain the differences between us and the SSP leadership. For example, the PCS members in Glasgow who have joined were all SSP members and the latest student recruit from Glasgow University was active in the SSP youth section for a year before taking the decision to join us. Youth work. We took a decision to turn towards the universities and colleges in a more organised and consistent way this Autumn. We now organise regular activity at two universities in Glasgow and at two in Dundee and also in Edinburgh. As a result, we have many possible recruits in both areas. The balance of the section has shifted towards Glasgow and the West of Scotland over the last year. While we have maintained and added to our forces in the East, this is a welcome and important development given the overwhelming weight of the working class in that region of Scotland. While our work in the SSP is important, we also ensure public activity is carried out under our own name. The paper, which we have produced seven issues of this year, is selling well. We have weekly stalls in our branch areas and organise regular public meetings which have been an important forum for recruitment and attracting new layers towards us. While the political situation is still complicated by the SSP and growth has been relatively slow we have been able to push forward. This has been achieved by orientating to workers in struggle, providing a Marxist pole of attraction in the SSP and carrying out independent youth work. Party building has gone forward over the last year. We have set up branches in new areas and the finance campaign - sales and subscriptions of Offensiv plus fighting fund - reached its best ever results. The number of subscribers to our paper is also steadily increasing. This improvement is despite this year, 2004, being a calm year, with almost no strikes or major struggles. Last year, we had the anti-war movement, the council workers’ strike and protests against health sector cuts. The explanation for this year’s progress is the improved structures and internal party campaigns, with a new layer of comrades taking responsibility in the branches. Despite the relative calm, we have been able to lead the most advanced local struggles this year. Comrades in Gothenburg led a campaign - including occupations and strong local support - that for seven months blocked the closure of a health centre. In Haninge we are leading a high-profile campaign against school lunch fees. Local campaigns with strong support have also been conducted in north Stockholm, Umeå and Luleå. The challenge is to manage the dual task of leading struggles and building the party. This requires a professional division of labour, with clear targets and meticulous contact work. But we cannot take things for granted. We constantly need to be making re-evaluations, explanations, modifications etc. to consolidate our achievements and go forward. Political education, individual discussions and experience from even limited struggles are the means to counter the increased objective pressures from work and school, the low level in the class struggle and inexperience. We put a lot of emphasis on the need to develop cadres. The first step is for comrades to take responsibility and the leading comrades and bodies within the party should assist with both collective initiatives (for example a study day) and individual ones (suggesting writing an article etc.). Summer and winter camps. Camps play an important role for political education and integration. 80 people participated in the winter ‘camps’ in Stockholm and Umeå in January. Close to 100 participated in the week-long summer camp. With more than 30 seminars and rallies at it, many comrades were involved in preparing lead-offs and contributions. The party branches growing fastest are those focusing on youth recruitment. We have put more emphasis again on Elevkampanjen, which will have its Conference on 4 January. A re-orientation towards the university in Umeå this Autumn brought new members plus good results in paper sales etc. Young worker members are the key to improving our trade union work. Women. 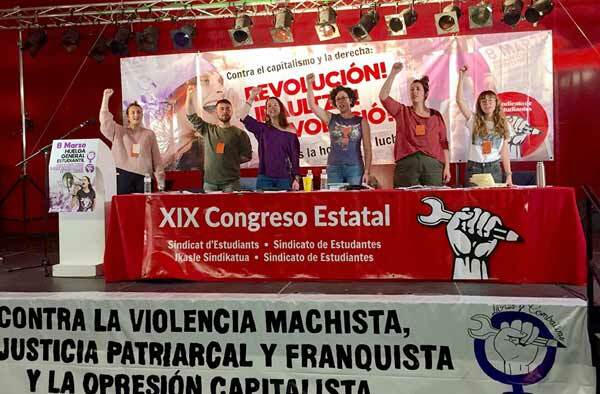 Last year’s party congress decided on a long-term drive to develop more leading female comrades. In March, 25 women members attended a national school for International Women’s Day. A study pack is under production. The leadership at all levels is responsible for individual discussions as well as political initiatives on women’s issues. Trade unions. During the past year, we have improved our trade union work. It was an important field for us in the early and mid-1990s, but when the whole trade union left became exhausted and gave up, the trade union work lost much of its impetus. This March, 27 comrades participated in our trade union day ‘school’. The paper now has more extensive coverage of trade union and work-place issues. In Umeå and Stockholm, we have members standing as candidates in branch elections of Kommunal - the council and health workers’ union - being held at the beginning of next year. The paper. During the first six months, we sold 2,584 papers per week on average (2,123 were subscribers). Of the subscriptions, 1,256 were paid through bank ‘standing orders’. The target for our yearly subscription campaign in December is to reach 1,500 standing order subscriptions. The number of permanent full timers is going to be down in January 2005. But the gap has been filled with special ‘apprentice’ full-timers - most often young comrades working for a year or less. At present, we have 8 such "apprentices" - 2 in Luleå, 1 in Umeå, 4 for the centre and Stockholm, plus 1 in Gothenburg. We are predicting a change of the political climate in our favour in the coming year. This has already begun. The threat of determined strike action from transport workers and post office workers has forced the employers to retreat and the crisis in the car industry is potentially explosive. The general anti-establishment mood, already expressed in the EU-elections in June, with the 14 per cent vote for a new bourgeois "EU-critical" party, will be supported by a more fighting mood in the workplaces. Combined with our current progress, this opens new doors for going forward more rapidly in 2005. At the beginning of 2004, the deep economic crisis and the growing pressure in the work-places affected us. Some leading comrades had to spend more hours at work, leaving less time for building and developing the organisation. We had to readjust and saw new young comrades developing as members of the leading bodies. We were able to assure a stable, functioning leadership was in existence when, in the middle of the year, a qualitative change took place in the class struggle in Israel. The section now has a better base on which to build the party. During the last year we have participated in many workers’ struggles: - the "Bikur Holim" hospital, the strike in the Haifa port, the fire-fighters’ strike in the North, and others. The ability of young comrades was demonstrated in practice. We will not stop recruiting the most advanced youth, but we must recruit workers also. On the basis of the reputation we have developed amongst the most militant workers and unions, we aim to establish an anti-privatisation forum, which we hope to be a base for organised, militant workers’ opposition to the Histadruth trade union bureaucracy. We have five branches, one more than last year. There is a stronger working class base in the northernmost and southernmost parts of the country and that makes the task of building our forces there a crucial one. We have also made a priority of building branches in areas where we can work with both Israeli Jews and Palestinians. We now have an opportunity to harvest the fruits of our hard work during the last few years. Many young people from towns where we do not have branches contact us and say: "You are the only organisation which appeals to workers. How can I join?". We have contact with people in three towns where we do not have a branch in the area. We could double our membership in a very short period of time if not for the lack of resources. Our financial situation holds us back. If we want to continue growing, finance must be one of our main fields of work for the coming period. We are at the beginning of a campaign for improving our fund-raising from outside the organisation. For the first time in the history of the organisation, we have a finance plan for 2005! The sales of our paper have a big effect on our finance. Usually we print an issue once in 6 weeks or every 2 months. We sell nearly the whole print run of 1200. The last issue was printed in the second week of October and all the copies were sold by the end of the month. He had to print a new one urgently! As a young section, Maavak Sotzialisti has mainly taken part in campaigns started by others. We believe that can be changed. Each branch now does public work in a working class neighbourhood in each city on a weekly basis. That will be one way to lay the basis for future campaigns led by our comrades. The basis is there for us to grow, and our comrades are the only ones to offer real solutions. Maintaining hard work on both the political and party-building fronts, we can become one of the most effective organisations in the Israeli left very soon.